King of the Motos Returns in 2013 as the Toughest Extreme Enduro in the U.S.
August 20, 2012 (Temecula, CA) – Touted as the toughest extreme enduro in the United States, King of the Motos, held in conjunction with King of the Hammers announced details of the 2013 event and has officially opened pre-registration. The “proof of concept” inaugural race in 2012 race was a self supported, twenty-one person invitational debuting in front of 30,000 spectators. Only six of twenty-one racers finished the brutal 85-mile course, adding to the mystique and reputation of the competition. Trials champion, Graham Jarvis from Great Britain won the race which combined punishing boulder climbs and descents linked with high-speed desert racing. The 2013 race will expand in length from the previous 85-mile course, passing through many of the infamous rock climbs and descents that have made the Hammers area so famous within the off-road scene. The race will keep the spirit of the “one rider, one bike” format with no outside assistance, even in pits. Expected to draw competitors from across the globe, the race will be an open invitation format with the overall winner taking home $10,000. Consisting of multiple flights, the first flight, front row will be reserved for champions of the events listed below. Once the first flight has left the notoriously brutal billy goat start, the following waves will be comprised of Pros, followed by Expert riders and rounding out the flights will be Amateur teams comprised of two riders, riding together with grid position determined through a short qualification prologue held on Saturday afternoon. The Expert and Amateur categories will race a modified course. 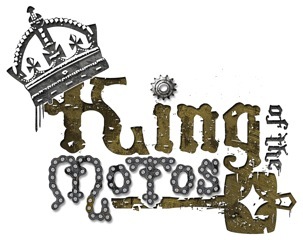 The 2013 King of the Motos will kick off the annual King of the Hammers week in Johnson Valley, CA February 1-8. King of the Motos main race will be held on Sunday, February 3rd. The weekend will be an interactive family event with riding, vendor booths, live webcast and Jumbtron feed of the racing action in Hammertown village. Watch the 2012 video highlights – Click here.